Volume 3: The Catholic Church in the United States of America: to Celebrate the Golden Jubilee of His Holiness, Pope Pius X. Publisher: The Catholic Editing Company, New York, 1914. ST. BONIFACE, Buffalo, NY. -- St. Boniface Church, or, as it was originally called, St. John the Baptist, was founded in 1849 by 40 German families, and is the third oldest German Church under the supervision of the first resident pastor, Rev. P. Kunze. The cornerstone was laid in March, 1849; the building, a frame one, was completed within a short time. A little school and a rectory were then built, and in 1851 Father Kunze found it necessary to enlarge the church. In 1854 Rev. 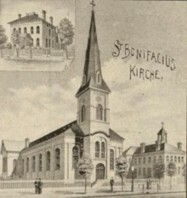 R. Follenius succeeded to the pastorate, and in 1856 he built the present brick church, 55 by 120 feet, at a cost of $10,000. The building was dedicated on June 15, 1857, by Bishop Timon. On the death of Father Follenius (May 27, 1859), Rev. H. Feldman was appointed to the pastorate. Father Feldman built a two-story brick school in 1861. He was succeeded in 1863 by Rev. J. Zawistoski; in 1866 came Rev. J. Soemer; and after a few months Rev. Nicholas Long took charge. During the latter's ministry the church was much enlarged, so that it now seats 1200, a new steeple and bells were added, and the brick rectory built. Father Feldman began his second term in 1873, and remained until his death on November 30, 1880. Rev. Chrysostom Wagner came on January 5, 1880, and was succeeded on June 5, 1884, by Rev. Ferdinand Kolb. Father Kolb was born at Erfeld, Baden, October 17, 1847. He studied at Constance and Louvaine, and was ordained on May 30, 1874, for Buffalo. Upon his arrival he was made rector at Dunkirk, where he served ten years1. He is assisted at present by Rev. Anthony Kampshoff. During his administration he paid off the debts, built a new brick convent for the Sisters (in 1888) at a cost of $10,000, and a brick school (in 1898) at a cost of $50,000. The parochial school is in charge of 9 Sisters of St. Joseph and has 380 pupils. The societies are: St. Stanislaus (two sodalities; one for young men and one for young women); Holy Family (for married men); St. Elizabeth (for Christian mothers); Children of Mary (for boys and girls). The parish population is 1600, and is decreasing as are all the older churches of the city. 1On p. 496 of the same volume is this statement regarding the association of Fr. Ferdinand Kolb with Sacred Heart R.C. Church in Dunkirk, NY. Fr. Kolb was appointed to that parish on November 18, 1874: Father Kolb was born at Baden, Germany, on October 17, 1847, and ordained at Louvain, Belgium, on May 30, 1874.